A wonderful body butter that contains deep healing moisturizers that restore the skin, taking it from dry, itchy and flaky to smooth, hydrated and healthy. Papaya enzymes gently keep the skin clear and free of dead skin cell buildup, while Pumpkin and Pomegranate antioxidants keep the skin young and protected from free radical damage. 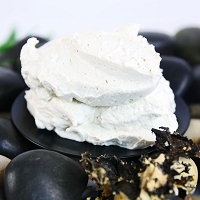 The result is a dreamy body butter that gives super skin results.